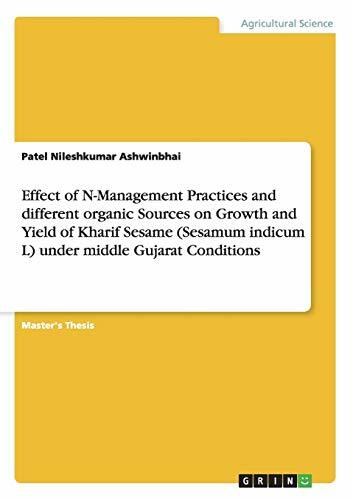 Master's Thesis from the year 2009 in the subject Agrarian Studies, grade: 2nd, Gujarat University (ANAND AGRICULTURAL UNIVERSITY, ANAND), course: Agronomy (Genaral), language: English, abstract: The present study focus on Effect of N-management practices and different organic sources on growth and yield of kharif sesame (Sesamum indicum L.). The treatment combinations comprised consisting of application of nitrogen viz., N0 (Control), N1 (25 kg N ha-1), N2 (Azospirillum) and N3 (50 % RDN + Azospirillum) relegated to main treatment and other sub treatments comprised of application of organic manure viz., M1 (Humic acid 10 kg ha-1), M2 (Poultry Manure 500 kg ha-1) and M3 (Vermicompost 500 kg ha-1). The results revealed that treatment N3 (50 % RDN + Azospirillum) recorded significantly higher. While, treatment N2 (Azospirillum) significantly the highest harvest index. Treatment N3 (50 % RDN + Azospirillum) recorded significantly higher seed yield (479 kg ha-1) and stover yield (1960 kg ha-1) of sesame. Application of humic acid 10 kg ha-1 (M1) secured higher seed yield (444 kg ha-1) and stover yield (1716 kg ha-1).The interaction effect of nitrogen and organic manure application revealed that treatment combination N2M3 (Azospirillum along with vermicompost 500 kg ha-1) recorded significantly the highest harvest index (39.20 %), but treatment combination N3M1 (50 % RDN + Azospirillum along with humic acid 10 kg ha-1) recorded significantly the highest seed yield (580 kg ha-1).